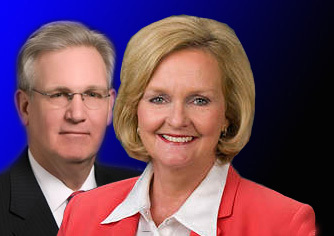 [box type="info"] We continue our series on the approval ratings of Midwest governors with Missouri's Jay Nixon...plus an added bonus: Senator Claire McCaskill. [/box] Missouri Governor Jay Nixon (D) was elected in 2008 after serving as a pro-active Attorney General. As AG, Nixon was knee deep in a number of areas from which others may shy away, especially school desegregation, capital punishment, and abortion. Nixon oversaw Missouri's court settlements that ended mandatory busing to achieve desegregation in St. Louis and Kansas City's public schools. He's also a supporter of capital punishment, and was criticized for soliciting campaign contributions from a utility company while his office was investigating them. Nixon expertly sloughed off those matters to win going away in 2008 by a 58-39 margin . The latest minor pickle Gov. custodia nera samsung s8 piu Nixon finds himself in involves travel. The press and lawmakers took umbrage at Nixon's penchant for flying here and there and paying for it out of various state agency budgets. Since taking office in January 2009, Nixon has charged off more than $420,000 in air travel to agencies he controls instead of his own office. The slap on the wrist he received for it hit about a week ago when the Missouri House stripped Nixon's travel budget from a cool $500,000 down to just $20,000 in preliminary action. This situation, of course, comes on the heals of a more serious and headline-splashed brouhaha in Missouri: the ethics/tax problems that came to light concerning U.S. Senator Claire McCaskill. The affable McCaskill was mired in her own travel-gate situation when Politico.com first broke the story that steadily went from bad to worse. As reported by ABC-affiliate KMBC: [box] "First, she billed the government for travel expenses to political event in Hannibal. sansung galaxi s6 edge custodia The travel was on an airplane partially owned by McCaskill and her husband. Second, she acknowledged owing more than $320,000 in delinquent personal property taxes on the plane and its hangar. McCaskill reimbursed the feds for the travel and paid the back taxes to St. Louis County. Whether these incidents were simple oversights, considerable damage has been done to the senator's reputation. Since entering the Senate, McCaskill has refused earmarks and criticized government waste. custodia a 8 samsung This magnifies her personal mistakes and is sure to haunt her in the next election. samsung s6 custodia "[/box] Missouri's show-me motto has often proved to be more than just an adage in some of our past polls there. Missourians are often slow to make up their collective minds. And many in the eastern population centers may be more worried about their beloved St. Louis Cardinals than the machinations of politicians. custodia corazzata per galaxy s8 But let's see what the polls results show when we asked 1,067 Missourians these questions: [box] In general, do you approve or disapprove of the job Governor Jay Nixon is doing? And... In general, do you approve or disapprove of the job Senator Claire McCaskill is doing? [/box] Here are the results for both: [table id=79 /] As we've seen elsewhere, hard economic times usually don't translate to good vibrations directed toward the guy in charge. But Gov. Nixon is enjoying the highest approval ratings we've measured in this series. While he's the subject of the usual amount of political snark thrown his way by the opposition (especially from Missouri Lt. Gov. custodia gomma samsung j7 2017 Peter Kinder--who has his own travel-gate tempest swirling around $35,000 worth of St. Louis hotel bills), those who think the governor will be easy pickings in two years may want to re-think their stance. Senator McCaskill is another matter. Her approve/disapprove ratio is in a tug-of-war with her lower ratings led by the state's large and important Independent voting bloc. McCaskill's past as an auditor and self-described watchdog have Republicans (and even some mainstream media) continuing to throw barbs. You can bet that "Air Claire" ads will be targeted to pick her apart as she approaches re-election next year. ——————————————————————— NOTE 1: This poll was paid for by We Ask America. The information has not been shared with any public official, candidate, cause or campaign. NOTE 2: A subscriber pointed out that when we first published this post we failed to change a notation in the poll results from Wisconsin residents (that was on our template we used) to Missouri residents.